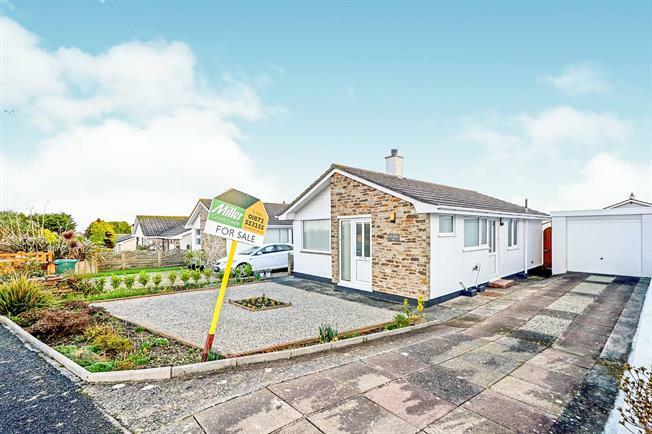 2 Bedroom Detached Bungalow For Sale in St. Agnes for Guide Price £280,000. This two bedroom detached bungalow is situated in this popular village location and is excellent decorative order throughout. The property is double glazed throughout and comes with off road parking, detached garage, night storage heating, sunroom and is offered to the market with no onward chain. UPVC double glazed door, opening onto the driveway. Double glazed uPVC window facing the side. Storage heater, tiled flooring, part tiled walls. Roll top work surface, wall and base units, inset sink and with mixer tap with drainer, integrated, electric oven, integrated, electric hob, overhead extractor. A range of built in cupboards. UPVC double glazed door, opening onto the garden. Double glazed window with obscure glass facing the side. Tiled flooring. Roll edge work surface, wall and base units, space for washing machine, fridge/freezer. Double glazed uPVC window facing the front overlooking the garden. Electric fire and storage heater, carpeted flooring. Double glazed window with obscure glass facing the side. Heated towel rail, tiled flooring, tiled walls. Low level WC, panelled bath with mixer tap, pedestal sink and wash hand basin with mixer tap, extractor fan and shaving point. Double bedroom; double glazed uPVC window facing the side. Storage heater, carpeted flooring. Double opening doors to sunroom. Single glazed wood window facing the rear overlooking the sunroom. Storage heater, carpeted flooring. UPVC sliding double glazed door, opening onto the garden. Double glazed uPVC window facing the rear overlooking the garden. Storage heater, carpeted flooring. Up and over garage door. Power and light. To the front of the property is off road parking giving access to garage. The front garden is low maintenance with gravel and inset flowerbeds. Gated access leads to enclosed rear garden laid to lawn with mature bush and flower bed borders and patio.